October is a tricky month in Bordeaux. It can maintain the warmth of summer, while entertaining cool evenings, or be dead cold. Each of these brings opportunities to the wine makers. Slightly overcast days are not unusual. It was just such an overcast, slightly cool day last October when we pulled into the gravelly drive of Chateau Lascombes. It was my second visit to the chateau and my first opportunity to spend the night in one of the beautifully appointed guest rooms. The team was in the final stages of harvest and the grape leaves were turning their fall reds and yellows. We walked through the vineyards and vat room and the smell of freshly pressed grape juice permeated the air, the air itself intoxicating. We tasted some of the grapes from that had been destined to become Lascombes, robbing ourselves of the wine to come. 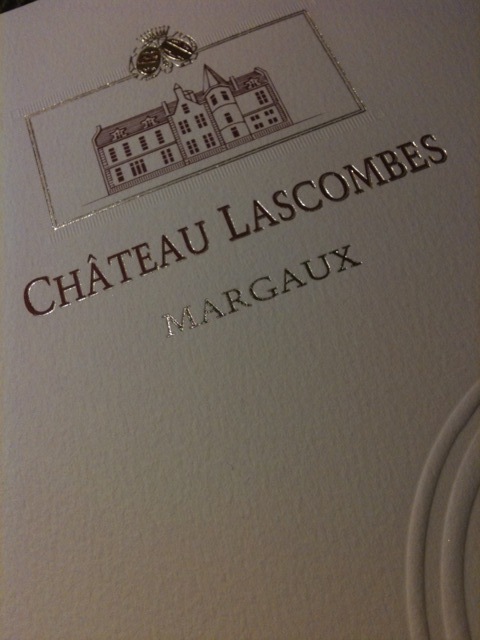 Situated in Bordeaux’s storied Margaux appellation and owned by Colony Capital since 2001, Chateau Lascombes is named for Chevalier de Lascombes, its first owner who was born in 1625. The existing chateau was built in 1867, turreted and the brick now ivy-covered. It is very easy to imagine hoop-skirted, corseted women in vibrant silks strolling the grounds with waist-coated men who carring ornate walking sticks. Today, it is more likely that you will see comfortably worn jeans with corduroy and cashmere, although silk scarves are always in vogue. Despite the hours demanded by the harvest, which is done by hand, Chateau Lascombes’ General Manager Dominique Befve, regaled the group with stories of the chateau, the challenges of harvests, and of course, the wines, over a delicious dinner hosted in the dining room of Chateau Lascombes. After starting with foie gras, the main course was scallops served in a leek sauce, followed by a selection of cheeses which included comte, brie, and blue, and finally a chocolate lava cake and coffee. 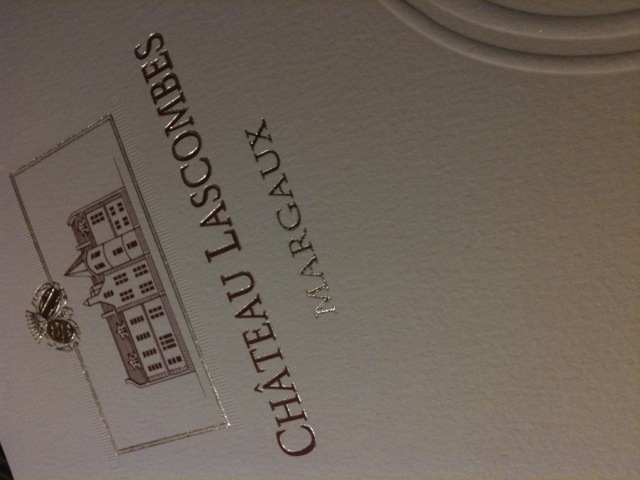 The wines accompanying the meal were a 2008 Chevalier de Lascombes, the second label of Chateau Lascombes, and a 2006 Chateau Lascombes Grand Cru Classe – Margaux (50% Merlot, 45% Cabernet Sauvignon, 5% Petit Verdot). Those adhering to the “white wine with fish” rule would be surprised at how magically the Margaux reds suited the scallops and their rich, creamy sauce. As delicious as the powerfully tannic ’06 Lascombes was after only 4 years of aging, I can only imagine what it will taste like after 10 or 15 years. The ’08 Chevalier held its own, and will stand up to aging 7 years or so. Thanks for letting me share this evening at Lascombes with you. I would love to hear about your experiences at chateaux and wineries. A beautiful sunny day spent at Smith Chateau Haut Lafitte in 2008. Stunning wines and a perfect atmosphere. Hope you enjoy the pics! Chateau Lascombes was one of my favorite stops of our 2008 trip to Bordeaux. It was a rainy day at the Margaux Grand Cru Classe and we were met by General Manager Dominique Befve, former technical director at Lafite Rothchild, who has served as “the boss” at Chateau Lascombes since 2001. After touring the vineyards, vats, amazingly lighted cellars, and chateau at Lascombes we enjoyed a wonderful meal with Dominique. The wine, of course, was excellent. In a few weeks I will be returning to my favorite part of France – Bordeaux. This will be my third visit to this exquisite wine-producing region. In preparation I have been gleaning through photographs that I took in 2008 and I thought I would share them with you. This first group is from Chateau Brown. The red wine of Chateau Brown is rich and luscious – a complex blend of the Bordeaux varietals that you savor slowly and enjoy with a nice piece of beef or pork. The white is a crisp sauvignon blanc that is wonderful with scallops and shrimp. We were there during the harvest of the grapes – that is one of the most exciting times to visit a wine producer. The care that is taken with the grapes – handpicking, sorting, and so on – goes a long way to explain the cost of some wines. I hope you enjoy the pictures! I’ll be posting more soon. When planning a few days at the beach, I of course, first thought about the food. 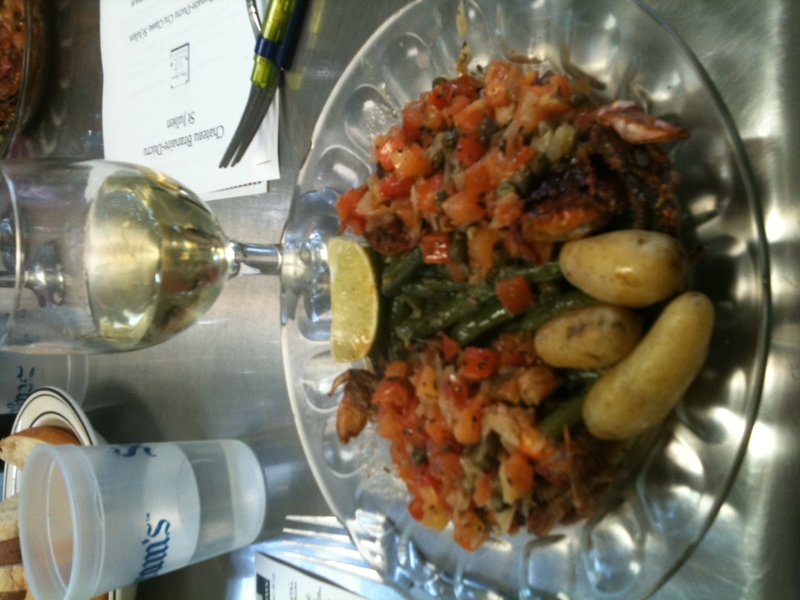 Fried Calabash-style shrimp, roasted oysters, steamed crabs, broiled flounder, and fruity boat drinks. What I didn’t think about was the hushpuppies – those delicious balls of fried corn batter and onions. Growing up in a small South Carolina town, the local chapter of the Lions Club (the International Lions Club is the world’s largest service organization), would hold fish fry fund raisers at the Community Hut. Everyone in town attended and it was a wonderful social event. The men in the community caught and cooked the fish outside on large burners, and the ladies made coleslaw kept the ice tea flowing. Our neighbor, Mr. Gary, made and cooked the hushpuppies, and they were the best – golden light, fluffy, and oniony on the inside, and crunchy brown on the outside. I liked them as much or more than the fish! So when we sat down to eat supper at the legendary Sea Captain’s House at Myrtle Beach and our waiter brought a plate of crispy hushpuppies it was almost a surprise. They were delicious and we enjoyed them both before our main course arrived and along with our flounder and shrimp, and they inevitably invoked memories and conversation of those Lions Club Fish Fries and Mr. Gary’s Hushpuppies. And, those boat drinks weren’t bad either. Hushpuppies are easy to make. I like to add rosemary to mine. Using a deep pot, preheat oil for frying to 350 degrees F.
Stir together the cornmeal, flour, baking soda, and salt in a deep mixing bowl. Stir in the onion and rosemary. Stir together the buttermilk and egg in a separate bowl. Pour the buttermilk mixture into the dry ingredients and mix until blended. Drop the batter, about 1 teaspoon at a time, into the oil. Fry until golden brown, turning the hushpuppies during the cooking process. (Tip: Dipping the spoon in a glass of water after each hushpuppy is dropped in the oil will make the dough easier to manage). I have to admit I’ve been on somewhat of a tomato binge lately. The first of the summer fruits are coming in locally and the crop has been delicious. This weekend at the local farmers market I picked up a couple of pints of beautiful grape tomatoes. After tossing some in my mouth and getting that wonderful pop of flavor as the juices explode from their skins, I decided to roast them with garlic to create a simple topping for pasta. 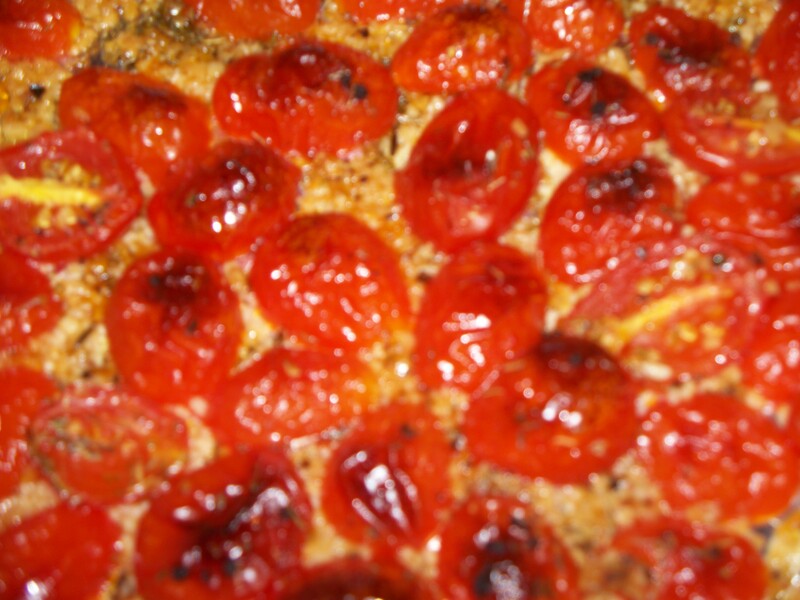 I set the oven to 325 degrees, then poured the tomatoes in a bowl and sliced them in half, long-ways. Then, after mincing 5 or 6 cloves of garlic and adding that to the tomatoes, I poured the mixture into a shallow roasting pan and poured 3 tablespoons of olive oil over the tomatoes and mixed them until coated with the oil. The tomatoes should then be sprinkled with kosher salt and freshly ground pepper to taste. As an after-thought I added a bit of dried thyme (my favorite herb) to the dish. Such small tomatoes only required roasting for about 30 minutes. I plan on eating mine with pasta, but they would make a wonderful appetizer as well served atop toasted croutons. There are any number of ways to serve this simple dish – hope you try it! We’ve just turned the corner – and it was a hard right. We moved from a mild, rainy spring to a triple digit summer without so much as blinking an eye. South Carolina is like that – when summer comes it means business. The arrival of summer brought an abrupt halt to the crunchy soft-shell crabs that have been showing up on menus throughout our coastal state for the last couple of months. I grew up in the Low Country of South Carolina and I can remember eating crab boiled with Old Bay Seafood Seasoning, but we never ate soft-shelled crab. I didn’t learn about that seasonal delicacy until I was an adult. I can say with complete certainty that when I was a child crabbing with chicken neck bait in the South Carolina marsh in an old john boat it never would have crossed my mind that there was a point in time when we could eat the entire crab! 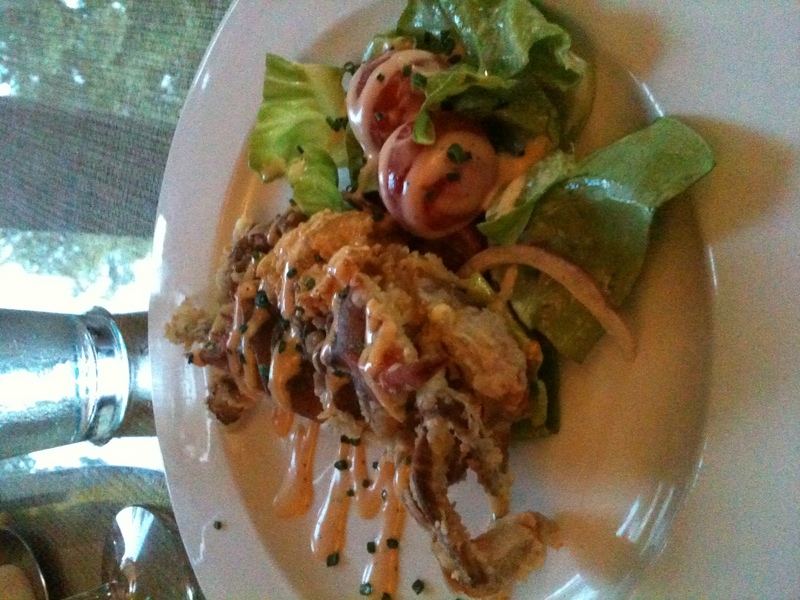 But, as they say, you live, you learn; and I’ve learned to love the crunchy deliciousness of the soft-shell crab and those few weeks each year when we can get them. A crisp Sauvignon Blanc is my favorite match for this dish. Hope you enjoy! Season crabs with salt and pepper and dredge in the flour, shaking off excess. Set aside. In a large skillet over medium high heat, add the oil and saute the crabs until soft, about 2 minutes on each side. Remove the crabs and set aside. Add the garlic and cook for 1 minute. Then add the capers and white wine. Cook until wine has reduced to about 1/2. Swirl in the butter and the chopped chives. Season with salt and pepper. Transfer crabs to a plate, spoon caper sauce over the crabs and garnish with paprika, garlic salt, thyme and pepper mixture.